Turkish restaurant in Central-Northern Bucharest, close to Piata Victoriei (Victoriei Square) and Gara de Nord (Northern Railway Station), Idomemos restaurant (also called Memos) is highly appreciated for its Turkish recipes and fast service. Lots of salads and dishes (mainly cold) are already prepaired, so all you have to do is to order. 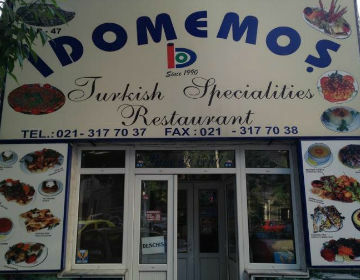 Locals in Bucharest have reviewd Idomemos Oriental in Bucharest. You can find here description, reviews, address, map, phone, website of Idomemos Oriental in Bucharest. Visit Bucharest Tips for more Oriental restaurants in Bucharest!